On the Path of Light the student begins to learn about spiritual concepts and their connection to the greater whole. Through 30 lessons and audio meditations you will learn how to connect with your spiritual self and expand your consciousness. The Path of Light teachers you about the power that you hold within you to manifest your reality on the Earth to meet your highest potential. It will show you what tools you need to use to create a balanced and harmonious life for yourself on the Earth. 21 Chapters filled with practical information and tools about Energy, Souls and Monads, The Light Body, Aspects, Karma, Chakras, Sensory Gifts, Universal Rays, Universal Laws, Basic Energy Work,Psychic Protection, Clearing Space, Crystals, Vibrational Essences, Light Technology, Ascended Master Tools, Decrees, and Affirmations. 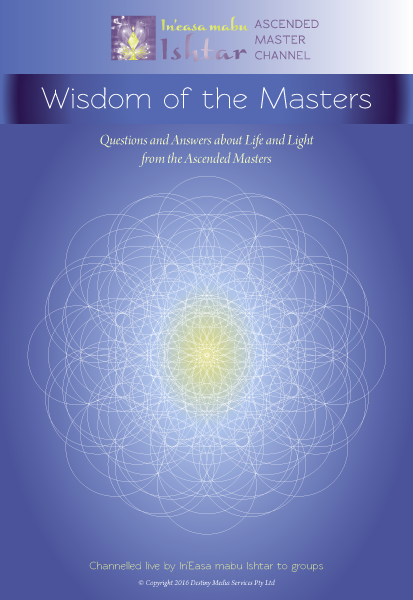 43 answers to questions about everything from the Ascended Masters. When you join a Path of Light group in your area you will pay the accredited facilitator a nominated fee for the group meetings over the 10-12 months. If you do not attend a meeting you will still be expected to pay. Chapter 7 What Choice will you Make? Chapter 24 What is Energy? Lesson 2 Enlightenment: Where is it? These are questions and answers from the Ascended Masters collected and transcribed over the hundreds of live group channels conducted by In’Easa mabu Ishtar. What are the Ascended Masters? How do the masters see us? How can I open my channel? Where does the Christ Consciousness come from? How can I be more in my spiritual life?